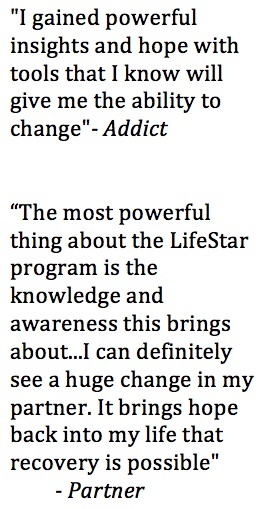 LifeStar is an Internationally recognized treatment program in nearly 40 Cities across the U.S. and Canada. Developed by Dan Gray and Todd Olson, LifeStar is run by highly trained and licensed therapists who specialize in sexual addiction recovery. Each phase of recovery is specifically designed to gently uncover, yet aggressively heal, the destructive patterns that create and maintain addictive behaviors. Workbooks, along with other materials, help provide education and structure throughout the different phases of treatment. Whether you are the individual with the addiction, the spouse or partner of an addict, or are concerned about your teen’s possible addiction, LifeStar has a plan specifically for you! CLICK HERE or Call 1-888-512-6757 to find a LifeStar office near you.